Kids days at the Saratoga Automobile Museum are a great way to introduce families to what the Museum has to offer. Each kids day in our spring series will include hands on activities that will guide them throughout the Museum. Examples include scavenger hunts, obstacle courses, book readings from local authors and arts and crafts projects. Enjoy the day off of school with your children by visiting the Saratoga Automobile Museum. Whether you have visited before or are exploring it for the first time, there is always some new automotive treasure to discover. Kids days are free for children to attend and occur from 10-4 on Feb 22, April 19 and May 24. Tour includes: round trip motor coach transportation and auto show admission. THIS EVENT SELLS OUT GET YOUR TICKETS EARLY! Please join us on our yearly pilgrimage to the NY International Auto Show. This is our 5th year making the journey to the worlds most amazing automotive event. Join us for our first ever Derby Day, “Healing with Horsepower” Fundraiser event on May 4th at the Saratoga Auto Museum! The event will be a day of fun for all ages and includes a chance to meet the therapy horses, music, wines, craft beers, ciders, spirits, and gourmet food samplings. A kid-friendly derby hat creation station will be available for a chance to win fun prizes as well as a silent auction and live viewing of the Kentucky Derby Race. If you are interested in available sponsorship opportunities or would like to donate an in-kind gift to our silent auction, please contact Jessica Wiley at info@thsaratoga.com or by phone at (518) 290-6240. As your mother gets in for free all we ask is for her is to tell us at minimum one embarrassing story of you (We would love it if she included pictures). Free to Spectators this year - Bring the entire Family! SPECTATOR ADMISSION IS FREE THIS YEAR - Bring the Family and check out all of the cars. Join the Saratoga Automobile Museum at the Saratoga Spa State Park for our annual Spring Auto Show, taking place on Saturday, May 18 (rain date is Sunday, May 19) from 9 a.m. to 3 p.m.
As a featured display, we welcome Cars of the Sixties to be featured around the Park's reflecting pool. Don’t forget with a car registration you get a ticket for the Museum, where we will be featuring our new exhibit Wheels of Change: Cars & Culture of the Sixties! Bring out your prized vehicles, It's only $10 per car! Fun for the entire family! We'll be welcoming some awesome local friends to join us! The day will include: Family Model T rides, as well as fun, interactive activities provided by Mad Science (Capital District), We Rock the Spectrum - Ballston Spa, The Children's Museum at Saratoga and National Museum of Dance! All European Cars, All years are welcome! Hand Made trophies! Independant Judging by Musuem Volunteers! Hosted by the Adirondack Corvette club. Bring your Beautiful Corvette to the equally beautiful Saratoga Springs Spa state park, while enjoying the beautifuly made cars on our lawn you can tour the surrounding springs and check out the beautiful scenery that the park has to offer. While your Father gets in for free we’d love it if he could tell us an embarrassing story of you, or that one time you were holding the flashlight while he let off a string of profanities while trying to fix the car. Come see the famous French Citroen’s in the beautiful Saratoga Springs Spa state park, while enjoying the beautiful French cars on our lawn you can tour the surrounding springs and check out the beautiful scenery that the park has to offer. The SEMA action network declared that this will officially be the tenth time that this day will be celebrated! We’re celebrating with buy one get one tickets! Join us at the Parting Glass Pub in downtown Saratoga to enjoy a buffet dinner and conversation with friends. The cost for the evening is $35.00 per person. This is a separate registration from the show. The 9th Annual Vintage at Saratoga will once again be held on the grounds of the Saratoga Automobile Museum. Vintage at Saratoga is open to all BMWs built in or before 1999 and we also invite all E 36 generation cars to join us. The weekend begins with a dinner in downtown Saratoga, New York on Friday night with the lawn show on Saturday. We will also plan drives on Friday and Sunday. Saturday’s activities will once again include a silent auction to benefit the BMW Foundation’s Street Survival program and its work to improve the skills of young drivers. Saratoga Automobile Museum is offering STEM based summer camps for three weeks this summer. Mad Science of the Capital District will be coming into the Museum to present their exciting program. Each day the campers will have a new creation to bring home (materials are included in the registration cost). Campers have the choice of staying for half a day or a full day with a discount offered for full day registration. All campers must bring their own snack and water bottle with them, and a lunch as well if staying for the full day. This camp is intended for children between the ages 7 and 12. Discover the world of robots and learn about robot programming. Build a OWI EM4 Robot to take home. This action packed week focuses solely on rockets and rocket flight. Learn about model rocket design, building, aerodynamics, propulsion, launching, safety, recovery, and repair. Build and bring home your own rockets. Discover claws, codes and constellations. The week will include many topics such as earth awareness, science of sport, nature and space. Step into the shoes of an engineer! Campers will build different engineering themed projects each day to take home. They will participate in collaborative challenges to solve real world problems while using critical thinking, cooperation and creative problem solving skills to test and improve creations. Last year was great lets make this even bigger! $10 entry fee into the show to be judged for the Top 10 and Best of Show. Spectators are free but are encouraged to make a donation at the registration tent. Please come out for a good cause and enjoy the day with friends and family. Campers will build a super strong bridge and dissect owl pellets. Build a geodesic dome to sit in and explore birds, beasts and bugs. Campers will mix, mash and brew in the chemistry lab to create items like cool sidewalk chalk. Assemble and control pulleys, levers, catapults, simple machines and mega pinchers. Hands on investigation of the science of sleuthing. Uncover the science involved in evidence gathering and analysis, fingerprinting and learn how to use spy equipment. Build your own spy wear including binoculars and spy glasses. THE AUTO X is an "In the Park" event and will be an ALL INCLUSIVE car show!! Motorcycles, trucks, muscles, exotics, classics, Euros, Tuners......if it runs bring it!! Admission will include access to the Saratoga Auto Museums Post Sale Auction cars! Have you wanted to drive one of the most iconic automobiles? Here's your chance! Members of the Tri-City Ts, will be providing this incredible opportunity. On Saturday, April 13, doors will open at 8:30 a.m. with classroom instruction at 9 a.m. followed by drive time behind the museum. Participants MUST attend the classroom session in order to drive a Model T.
Cost is $10 for Museum members and $15 for non-members (students are FREE). The Saratoga Automobile Museum (“SAM”) presents the Model T Restoration Program running from November 2018 to April 2019 culminating with the Annual Spring Auto show in May with Model T rides and debut of the Hoffman Car Wash Jiffy Lube restored 1923 Ford Model TT, a heavier bodied version of the Model T.
SAM offers a wide variety of programming with a focus on collector cars. Part of the museum’s mission is to attract children, young adults, as well as “kids” at heart to the car hobby and provide them with lifelong learning. The Model T Restoration program is an opportunity to learn about the history of the Model T; the mechanics, ignition, electric and actual hands on experience restoring a 1923 Model TT with members of the Tri-City T’s Club. The Tri-City T’s, a chapter of the Model T Ford Club International, Inc. (MTFCI) and Capitol District Chapter, a chapter of the Model T-Ford Club of America (MTFCA) are partnering with the Saratoga Automobile Museum to present the Model T school and restoration program. The purpose of the club is to promote fellowship, preservation and education of the Model T Ford by providing support to individuals interested in restoration, automotive history, and folklore of its use in the early twentieth century. Ownership of a Model T Ford is not a requirement to become a member of the MTFCI, MTFCA or Tri-City T’s/Capital District Chapter. The Capitol District Chapter/Tri-City T's and The Model T Ford Snowmobile Club will be demonstrating 2 to 3 Model T Snowmobiles on Saturday, February 9th, from 10:00 AM to 2:00 PM, at the Saratoga Automobile Museum. Club members will be on hand to give rides and answer questions. The Model T Snowmobiles will be located across The Avenue of the Pines from the Museum; please park at the Museum. There will be a presentation on the differences between the Snowmobile and a regular Model T in the Saratoga Automobile Museum with admission. While at the Museum, check out the progress on the Model T Restoration program. Any questions, contact Holly Hulfish, 518-587-1935, ext 23. On Friday, December 21 we'll be hosting a festive Kid's Day at the museum from 10 a.m. to 4 p.m. with holiday refreshments and fun activities! Celebrated local authors, Danielle Searles and Elizabeth Macy will be performing readings of their books. Also, the Tang Museum, along with We Rock the Spectrum Gym, and Saratoga Kids Yoga will have entertaining activities. Of course no holiday event is complete without a visit from the man himself, Santa Claus! 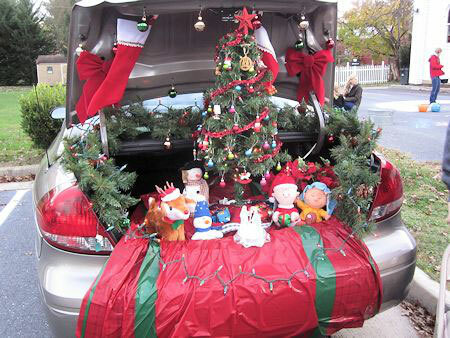 The Saratoga Santa will be here while the trunk trimming contest takes place in front of the museum from 2 p.m. until 4 p.m.
Come out and experience a holly, jolly good time at the Saratoga Automobile Museum! Join us on Saturday, December 15, 2018 from 10 a.m. to 12 p.m. for our first Cars & Crafts! Families can enjoy hot cocoa and cookies, holiday crafts, and will even have a chance to design their own gift wrap to bring home! Kids admission is FREE and adults only pay standard museum admission. “Vintage” takes an in-depth look at the Vintage Sports Cars that have long been at the center of early road racing in America. With over 16 Vintage Racers on display you won’t want to miss this exhibition. The VSCCA remains true to its founders and is an all-volunteer group. It maintains its focus on the cars that created the sport in America such as pre-war Bugattis and Bentleys, the post war production cars like MGs, Morgans, Jaguars, Alfas and Austin Healeys. Members are free! Hope to see you there. Saratoga Springs, NY – The Tri-City T’s, a chapter of the Model T Ford Club International, Inc. (MTFCI) and Capitol District Chapter, a chapter of the Model T Ford Club of America (MTFCA) are sponsoring a public exhibition day Saturday September 29, 2018 at the Saratoga Auto Museum, 110 Avenue of the Pines Saratoga Springs, NY 12866. The event is hosted by the Saratoga Auto Museum and is held in conjunction with the “Annual MTFCI International Day of Touring”. This event was started two years ago with the intent of getting as many Model T Fords worldwide out touring for the day to allow for public viewing and education on “the car that put the world on wheels”. The purpose of the club is to promote fellowship, preservation and education of the Model T Ford by providing support to individuals interested in restoration, automotive history, and folklore of its use in the early 20th century. Ownership of a Model T Ford is not a requirement to become a member of the MTFCI, MTFCA or Tri-City T’s/Capitol District Chapter. The chapter officers and members encourage any individual interested in learning more about the Model T Ford to attend in order to experience the cars up close along with their owners. The exhibition will take place in front of the Saratoga Auto Museum on Saturday September 29, 2018 from 10 am to 2 pm. Model T Ford automobiles, including several interesting variants of the car (snowmobiles, camping equipment, etc.) will be on display for close inspection. This event is not a car show. This is a “hands-on” type of event. You will be encouraged to sit in the vehicles, lift the hood, inspect from every angle and ask as many questions as you would like. The Model T Ford exhibition is completely free to the public. More information on the club and Model T Ford hobby may be found on the web at www.modelt.org and www.mtfca.com. Come to the Museum and get a good deal on cars that didn't sell on the block! Join us for an exclusive evening of Bugatti's, cocktails, hors d'oeuvres and live music exploring our Bugatti exhibit including Peter Mullin's Type 57SC Atlantic. This is a once in a lifetime evening as the Museum will be adorned by the finest Bugatti's from around the world. Tuners In The Park 4 will be held at the Saratoga Automobile Museum. Rain Date will be August 12, 2018 - same times!